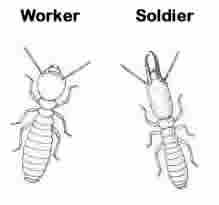 The worker is the termite that performs all the daily duties of the colony. The worker collects the food, distributes the food, cleans, grooms the others, takes care of the young, etc. You would only see these if you dug into the ground or the wood they were in. The soldier is the protector of the colony. The soldier will defend the colony against any thing that may harm the colony, even if it means sacrificing its own life. The swarmers or secondary soldiers and queens. These insects are the only ones that ever leave the colony into the outside world. The swarmers have only one purpose, which is to leave the colony to mate and produce more termite colonies. This swarm will usually take place on a warm spring day after a rainfall. 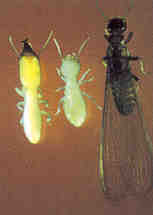 Some types of termite do swarm at other times of day and season. Termite control had not changed in its procedures or chemical compounds for many years, then in the late 60’s and early 70’s some of the compounds came under fire. The long lasting chemicals such as chlordane, heptaclor, and aldrin, that had for many years been used and proven very effective for termite control were removed from use. In the early 70’s several new formulations were introduced for termite control. Most if not all of these products were agricultural chemicals already labeled for other use. Dursban T.C. was the most popular of these products. By the 80’s and into the new century many new products have come into the termite control market. Some of the compounds proved to be less than desirable. The race for a new great termiticide introduced some new compounds into the industry. With these new products came the varied opinions of each manufacturer. The one who made the chemical that repelled said repellency was good, and the other side said it was bad. This debate ran on for years. The problems however with the old products were the longevity of the products in the environment if moved from the target areas. So the search was on to produce a termite control method that was effective, long term, and environmentally friendly. A new way of thinking began to emerge. Rather than place hundreds of gallons of chemicals into the ground to create this hopeful barrier around the structure. Why not design a baiting system to eliminate the colony. 20 years ago Dow agro-sciences began research into the proper and effective way to accomplish this elusive goal, but after many years of research and development Dow created the very best termite control system on the planet. Introducing the Sentricon colony elimination system. A whole new concept in termite control and best of all it works, in fact it works better than the other chemical treatments. No longer was several hundred gallons of chemical needed. Only grams of active bait was needed and only where active termites were found. Wow—-an environmentally friendly product that actually does a better job. Sentricon stations are placed around the perimeter of the structure as monitors/ interceptors. When the termites begin to feed they are introduced into the bait tube where they are forced to feed through the bait matrix and they continue to feed and return with others to feed on the bait. This process continues until complete elimination is realized. No other bait system or chemical can claim complete elimination. Dow Agrosciences has produced the finest baiting system available at any cost. We at Bales say with pride that we are one of the few that could use any baiting system available, and have chosen to use Sentricon, because it is the best. The in ground station, the bait tube, cap, monitoring device, And the AG (above ground) bait station. These components are a very important part of the Sentricon program, but the most important part of the program is the company and the service person coming to your home. One of the new products does seem to come close. Lets go a little further. Compared to the products of the past, Termidor is miles above. Very low dosage rate, so less product is needed. But we still are using the same technology for application and several hundred gallons are generally used, (as per label) to treat a structure. Again you decide. Termidor has a great track record so far, around 7 years + in the field. You might ask-well how long will it last? The correct answer is, we just don’t know. This is an excellent chemical option for termite control. We perform these treatments every day because some people are simple more comfortable with what they know. We are confident in this product, but we want to be honest with its limitations. Here is a short video of the application procedure and methods of Termidor. Use the most effective methods. Utilizing the safest and environmentally methods. If chemicals are needed for termite control, use them as a spot and remedial treatment. Creating a satisfied customer, while protecting them as well as their property.